I gave some to my MIL & FIL because they also didn’t have any this year. Hope they like it. Natural food coloring of your choice. Emily said “No Blue!” I chose pink. 2. Mix the coloring with the warm water. 3. Slowly pour the warm water and mix it. I used a wooden spoon and later use hand to mix it into dough. 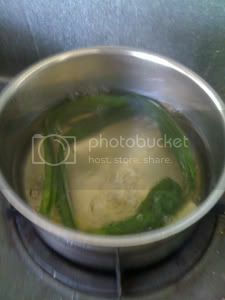 Do not add too much water because it will be too sticky, hard to pick it for boiling. 2. Add rock sugar to taste. 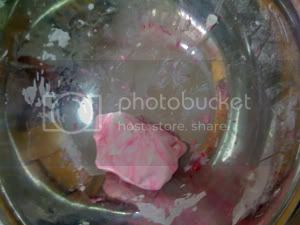 I use 1.5 piece of rock sugar for ½ pot of water. If too sweet, just add water. Last step, boiled another pot of water to cook the tang yuen. 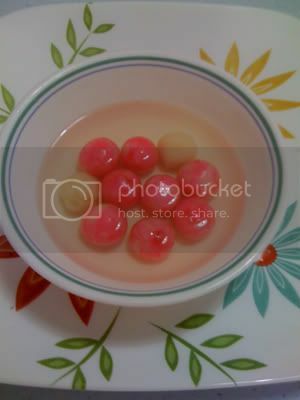 When the water boiled, put all the tang yuen balls inside. Once it is cooked, the tang yuen will float to the surface. 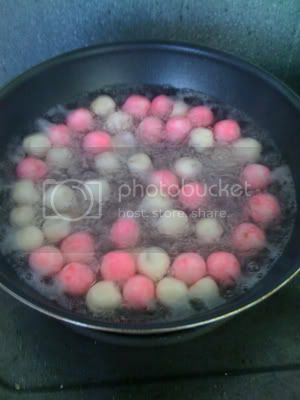 Use a big metal sieve, pick up the tang yuen from boiling water, run it through cold water. This will give a good texture to the tang yuen. Put the tang yuen into the syrup water to boil in a low fire. Once boil, it is ready to serve. Quite easy to DIY eh? 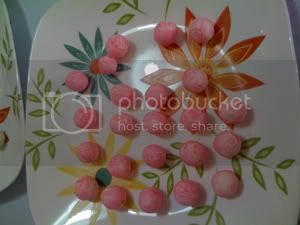 So did the peanut butter filling tang yuen turn out well?